After a long trip of trekking, visiting many historical places, sight-seeing of Vietnam, now you feel tired and want to relax before going back to work. We are pleased to become your companion during the last minute of the journey. 16:30 picking up at your hotel by cab, transfer to Golden Dragon Theatre enjoy the Water Puppet Show at 17:00, a traditional art which is unique on the world. Not watching Vietnamese Water Puppet Show means not visiting Vietnam yet. 17:50 continuing to visit Spa where brings you the feel of Vietnamese home. Come to enjoy green tea, ginger jam when soaking your foot in herbal water, then you have 60 minutes for foot and hand massge at the best massage technique. 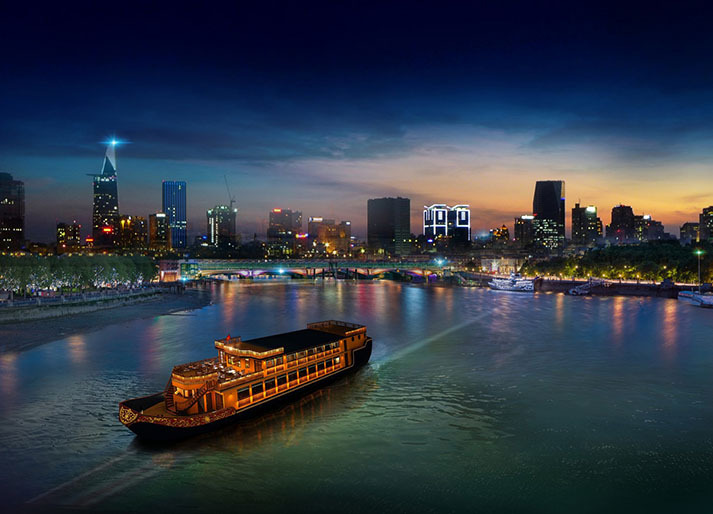 19:10 departing to Saigon Riverside where embarking Cruise, the beautiful cruiser will travel around Saigon river in splendid night. Enjoy your dinner on board with some entertainment show then disembarking at 9:45PM. Transfer by cab back your hotel. - Transportation by taxi on request. - Set Menu Dinner on boat ( no drinks on meal). - Water Puppet entrance fee. - Foot and hand massage in spa. Note: Itinery may change due to whether or availability of service, tour is excluded VAT.